When Denny Hamlin rolls into Richmond Raceway it brings an air of familiarity, giving him a depth of knowledge about the Virginia track unlike any other on the Monster Energy NASCAR Cup Series schedule. That knowledge stems not just from Hamlin having visited the track twice a season for the past 13 seasons, but because the veteran driver and native of nearby Chesterfield, Va., — approximately 30 minutes south of RIR — attended many races here growing up. Sitting in the grandstands he envisioned one competing on the track himself, something he’s now done 40 combined times across NASCAR’s three national series. Hamlin will make his 41st start on what he considers his home track Saturday night in the Toyota Owners 400 (at 7:30 p.m. ET on FOX, MRN and SiriusXM NASCAR Radio). As he is every time he turns a lap at Richmond before a partisan crowd filled with a multitude of family and friends, Hamlin isn’t lacking motivation to do well. Perhaps in part because of his intricate knowledge that comes with Richmond being his home track, Hamlin’s boasts a stellar record on the three-quarter-mile oval. Rarely is it that the No. 11 Joe Gibbs Racing Toyota is not either leading or up near the front. Hamlin’s 1,659 laps led in 25 Cup starts are the most among active drivers, while only Joe Gibbs Racing teammate Kyle Busch has more wins (six to three). 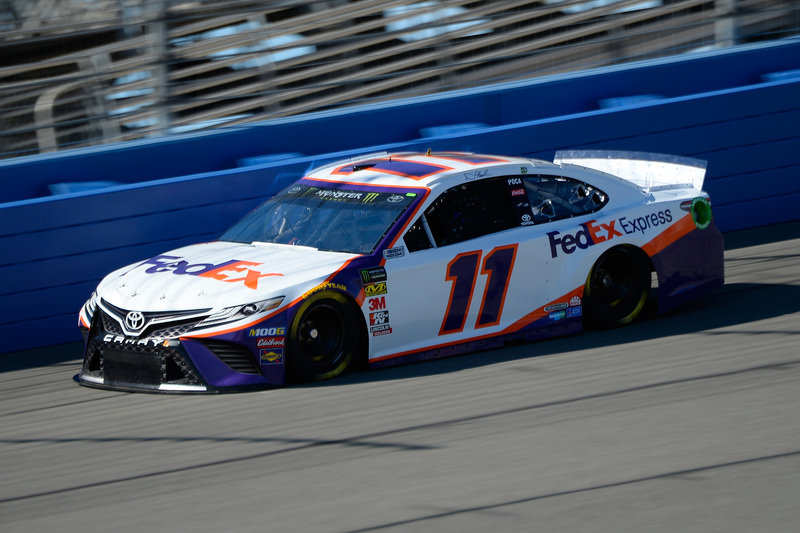 “It’s just exciting because I know that I very well could have a great weekend ahead of us and really focus a lot of my efforts on how can we go out there and dominate the race, not just win but dominate,” Hamlin said. “That’s been the primary focus for the last five days and hopefully we put it all together for tomorrow night. Hamlin’s last victory at Richmond occurred in 2016, and in the subsequent four races he’s posted two third-place finishes and a fifth. Busch has won the won the past two races here and can become the first driver since Bobby Allison in the early 1980s to win three straight races at Richmond. And as if he needs another reason to feel good at his home track, Hamlin comes into the weekend enjoying the best start to his career, having scored two wins — one of which was the Daytona 500 — and seven top-10 finishes in eight races this season, and is only 27 points behind Busch in the standings.